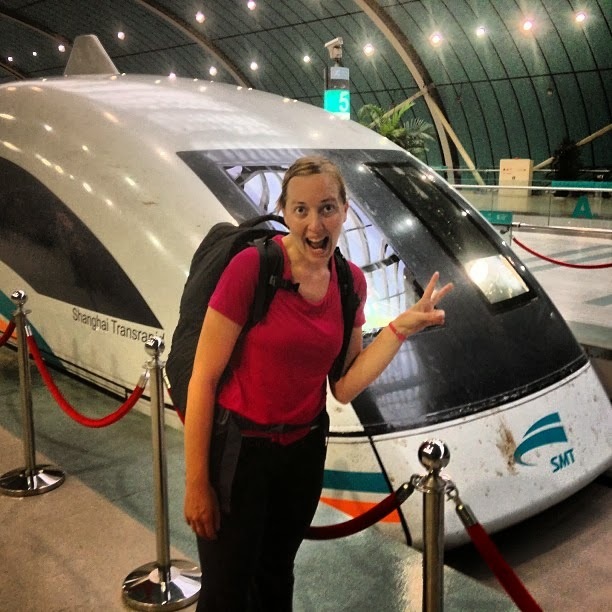 Have Wife Will Travel: We get Shanghai'ed in Shanghai!! We get Shanghai'ed in Shanghai!! Shanghai had not originally been on our list of places to go this trip. My impression (based on absolutely nothing of value) is that it would be your run-of-the-mill expensive international city. If you would like to see my naivity prove me wrong, please finish reading this post! When we met our friends Helena and Dave over the now infamous could-have-been-a-knife-fight in Kunming, they invited us to come stay with them in Shanghai. However, as this invitation was made at 2am, after plenty of drink, and with the understanding we would not be coming to Shanghai, we weren't sure it was more than polite British talk. So we called them up a week later, and, well-rested and sober they said, "come stay!" 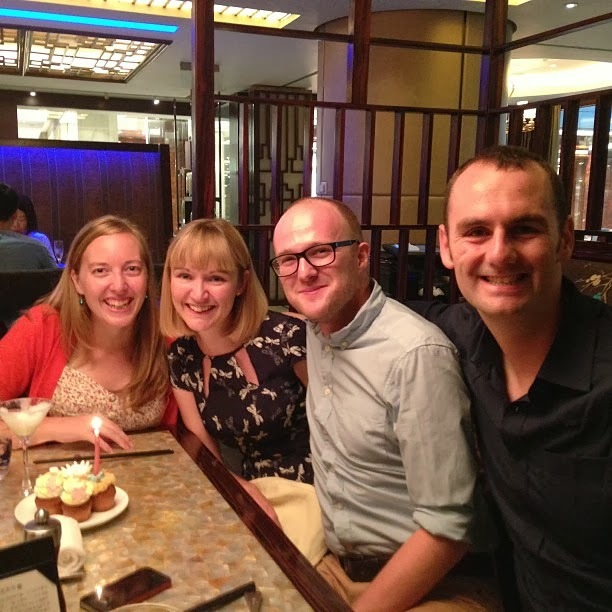 We arrived in Shanghai a couple of weeks later and were very happily surprised. The first happy surprise is when you arrive at the airport and there are two options to get into the city center: the first is a local metro which takes about 50 minutes and is your basic local metro. The second option is a magnetic levitating train (MagLev) which zooms you to the city center at a whopping 300 km/hr, as you hover above the tracks. Yes please!! 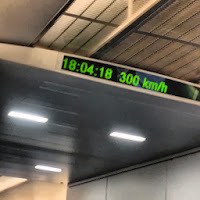 The coolest thing about the MagLev is that as it hovers above the tracks, and then you bank for a turn, the entire train feels like its flying. We'd love to have these a home, but we realize it can't be done in a capitalist country. We paid $12 US for both of us to ride, on a not-full train that runs every 15 minutes (it has to run that frequently, in order to truly be faster than the local metro). It's a heavily subsidized train that is in place as a showpiece for Shanghai to show off to impress the rest of the world. And we were duly impressed! We arrived at our friends' home, an old 4-story house in the beautiful French Concession. As a result of the first Opium War in 1842, the city handed over sections as settlements to the British, French and Germans, which remained as their territories until World War II. The French Concession is now a lovely neighborhood with tree lined boulevards and old manor houses, some of which have been converted to multi-family apartment buildings. You climb the dusty stairs to the apartment, over creaky stairs and past floors where several private rooms share the kitchen equipment in the open hall (and start to wonder about where you'll be spending the week!). Upon arrival to the top floor, however, we absolutely loved their beautiful apartment, and often threatened to lock the door when they were out, and just move in. We spent the rest of the week enjoying Shanghai, playing games, hanging out, eating and drinking far too much, etc. 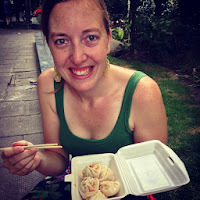 So, we'll give a listed run down of our favorite spots, and the reasons we ended up loving Shanghai. - Shanghai Propaganda Poster Art Centre: Located in the basement of an unremarkable apartment block, this was a wonderful museum! 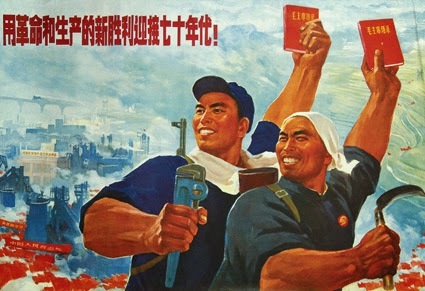 Collected over years by the owner of the museum, and displayed chronologically, the collection shows Communist propaganda posters throughout the years (and into the late 1990's). 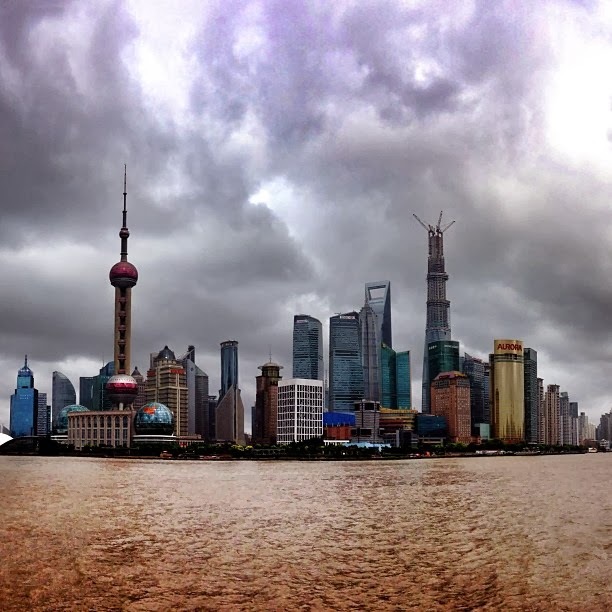 - The Bund: The waterfront in Shanghai demonstrates what I loved so much about the city. On the west side is the Bund, a collection of very old and very lovely buildings, most of which used to be banks. Imagine where Mr. Banks went to work in Mary Poppins, in his top hat and all. On the east side of the river is Pudong (which is incidentally not a nice thing to call your wife), with its futuristic skyscrapers, Pearl Tower, and the Bottle Opener (the world's 6th tallest building, next to which they are building what is prepped to be the 2nd tallest in the world, and looks just like a bottle). 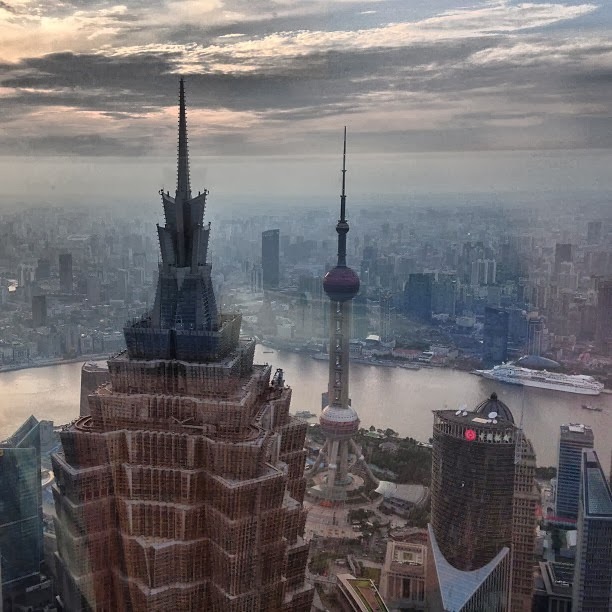 Shanghai has room to be both a city that evokes the romantic and mysterious Orient, and a futuristic powerhouse. -Xiao Long Bao: otherwise known as soup dumplings, and a perfect budgeteer meal. Although you can get them across China, they are the specialty here, and delicious!! Saunter up to one of the many little stalls selling them, point to a steaming basket of 8 Bao, pay them $1.10 and sit down on a curb to enjoy! Dip bao in vinegar and pop it in your mouth whole (otherwise, you'll get the soupy center everywhere). Yum! 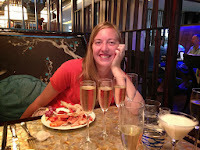 - Martini Brunch at the Ritz Carlton: This is not a suggestion for fellow budgeteers, but boy was it a fabulous splurge!! You arrive at 11am, try as hard as you can to try all 13 martinis on the brunch menu by the time they cut you off at 2pm. 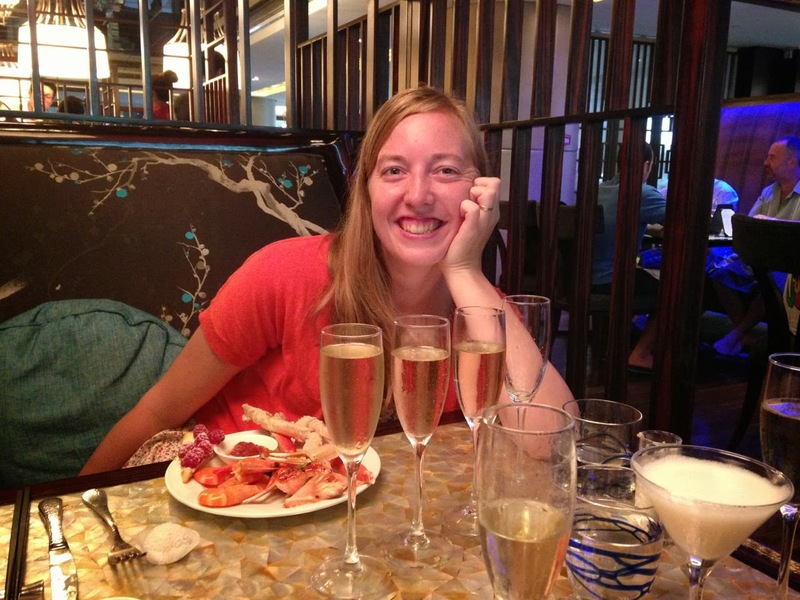 In between getting "suitably sloshed" as Helena would say, you graze on lobster tails, crab legs (by the end of brunch, I'd had so many platters of crab legs, both my thumbs were all sliced up! ), fois gras, sunday roast, and the biggest dessert island ever. We ate at home for the rest of the week, but boy was it worth it! !